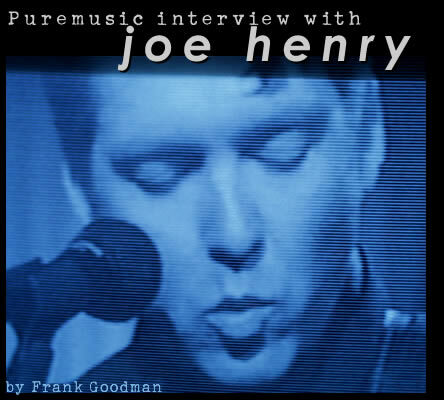 We feel very fortunate to present a lengthy, friendly, and technically intimate conversation with one of the most interesting and talented songwriters working today, Joe Henry. We got turned on to him in our interview some time ago with Steve Earle, who sang Joe's praises as one of his favorites. So we wasted little time in acquiring a cross section of his work. We quickly got the picture that Joe began more in the singer songwriter, alt-country vein and made the almost unprecedented journey toward a more jazz inspired groove music with lyrics that were following a sympathetic trajectory. It was progressively less linear, more atmospheric, and the cast of characters changed accordingly, including musicians as diverse as the Jayhawks and Ornette Coleman. Alas, my description falls short, but what follows is much more complete. What's fascinating to this writer is the unique evolution of this artist, and how it continues to unfold. I asked Joe about it, and he was kind enough to walk me through the whole discography. That's not something I would normally consider that interesting. But when an artist continually mutates over time (unlike, say, Neil Young, who seems more of a zig zagger), we think the method to his madness is worthy of explanation. Some peripheral circumstances create notoriety spikes in the artist's profile: being married to Madonna's sister Melanie, appearing recently in an episode of Dharma and Greg, and producing the Grammy winning comeback for 60s soul icon Solomon Burke. You see what I mean, he's an enigmatic and fascinating fellow. Tiny Voices (on Anti Records, see our review last month) is the fabulous new Joe Henry album, and you will find clips from that and the previous and wonderful Scar on the Listen page. His website has a preview of a short film about the record by Steven Lippman, check that out. And now, a telephone call with the artist.